For honeybees, there’s no place like home. And every year, they must find a new one. 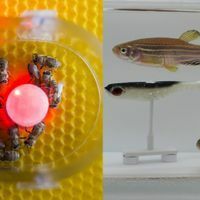 Now, a study publishing today (December 8) in Science suggests that the honeybee swarms use inhibitory signals when house-hunting, paralleling the human brain’s decision-making process. 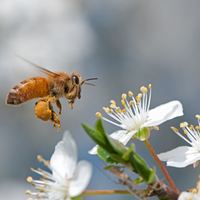 “It’s just another lovely example of the amazing sophistication in the honeybee population,” said University of Sussex apiculturist Francis Ratnieks, who was not involved in the study. It also shows a “commonality in the decision making processes between a brain and a swarm,” he added. Every spring, about two-thirds of the honeybee colony split off from the group to form a new swarm, but until they find a roomy, hollow tree to call home, the thousands of bees wait in a tree branch as a few hundred scouts explore new prospects, said mathematician Mary Myerscough of the University of Sydney in Australia, who was not involved in the study. After canvassing one potential home site, each scout returns to the group and reports the quality of the site by doing a waggle dance on the swarm surface, literally dancing on a platform of bees. Individual bees don’t compare multiple sites, but visit only one and instinctively know the difference between a so-so spot and “a bee five-star mansion,” Myerscough said. The better the digs, the longer and more vivaciously they dance, thereby recruiting more bees to their site. The scout who recruits a certain threshold number of bees wins, and the swarm heads to that bee’s scouted location to set up shop. But if two nests are equally cozy, the bees risk a deadly stalemate. The swarm has only one queen bee, after all, so it can’t split up, and thus must agree one a single nest site. To find out how they avoid deadlock, bee biologist Thomas Seeley of Cornell University and his colleagues set up two identical nest boxes on a remote Maine island, then released a swarm of honeybees. Scouts who visited one nest box were painted with a yellow stripe, while those who visited the others were painted pink. Then, the researchers watched the scout bees jockey for one nest or the other. The scouts waggled for their sites, but they also took time out from dancing to stop other bees from doing their jigs—by head-butting them and emitting a high-pitched beep, Seeley said. Using these inhibitory signals allows the bees to break deadlock and decide on a home faster, because once one site gains even the tiniest edge over the other, there are more bees on the winning nest side to stop the other side’s waggling, accelerating the inequality and allowing the bees to choose a site more quickly. “It amplifies differences in the support for the two sites that are actually equal in quality,” Seeley said. 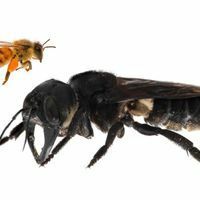 While prior research had shown that bee head butting could warn bees away from risky foraging situations, this is the first time it’s been shown to hasten the consensus-reaching process. The bees’ waggling standoffs parallel how primate brains process information, Ratnieks said. To determine which side a sound came from, for instance, neurons from the left and right ear might both initially fire. But neurons will also suppress the firing of neurons from the other ear, and once a threshold level is reached, the brain concludes that the sound came from the left. The findings could also have implications for artificial intelligence and some crowd-sourced decision-making systems. In the US primary elections, for instance, votes are aggregated from many individuals to make a decision for the group, and only one candidate can prevail in the end, Seeley said. 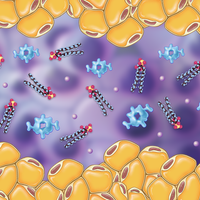 In theory that could potentially benefit from some built-in negative signaling, he added. “That’s not something we humans are entirely fond of because we don’t really like negative campaigning,” he said. 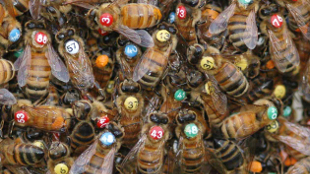 T. Seeley, et al, "Stop Signals Provide Cross Inhibition in Collective Decision Making by Honeybee Swarms," Science, doi: 10.1126/science.1210361, 2011.